A book version of a PhD recently defended at the University of Ghent (Belgium) has just been published. The author, Ms Jinske Verhellen, has endeavored to examine how well the Code of Private International law, adopted in Belgium in 2004, has fared in practice. More precisely, the research sought to find out whether the objectives set out by the Belgian legislator when codifying its private international law, have been met in practice. The PhD research was supervised by Johan Erauw and Marie-Claire Foblets. 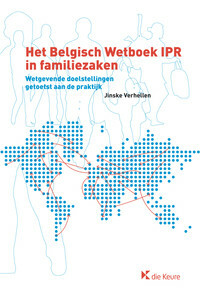 Although the PhD focuses on the practice in Belgium of cross-border family law, with scant attention to comparative law, the research carried out by Ms Verhellen is remarkable because she applied an empirical methodology : far from relying on the works of learned authors and scholars, Ms Verhellen has attempted to study the actual practice of cross-border family law in Belgium. In order to do so, she has relied mainly on a very impressive database of the KMI, a first and second line helpdesk providing advice to lawyers, courts, social workers and city authorities in the field of cross-border family law. This database bundles more than 3.000 files, going from very simple questions put to the helpdesk to more elaborate advice given by the lawyers working at the KMI. Ms Verhellen has also conducted semi-structured interviews with people in the field – mainly judges with a proven track record in cross-border family cases. Finally, she had access to a wealth of cases, many of which unpublished, which allowed her to get a very good grasp of how the rules are applied by courts and administrations alike. The results of this research are very interesting. Ms Verhellen whose previous publications also touched upon cross-border family law, shows for example how little use has been made of the possibility offered by the Code to spouses who may select the applicable law in case of divorce. This does not bode well for the party autonomy under Rome III. Another finding is that courts and practitioners have been struggling with name issues in mixed families. Although the Garcia Avello ruling should have made it easier for dual nationals to obtain the same name in the two countries they are nationals of, the research shows that children born in Belgium out of parents with different nationalities, are still frequently treated as if they were only Belgian nationals. This may explain why the Commission recently instituted infringement proceedings against Belgium. Building upon these findings and many other, the book concludes with an impressive list of policy recommendations. Although its focus is rather narrow, as it almost exclusively deals with conflict of laws rules adopted by the Belgian legislator, this PhD could nonetheless be inspiring as it allows the reader to sense the added value of an empirical methodology for private international law research.